Quilt Market hang over - Stop staring and start sewing! I'm back from Pittsburgh but still could use another full nights rest in order to feel completely human again. It was a frantic fabric frenzy and I loved every minute of it! 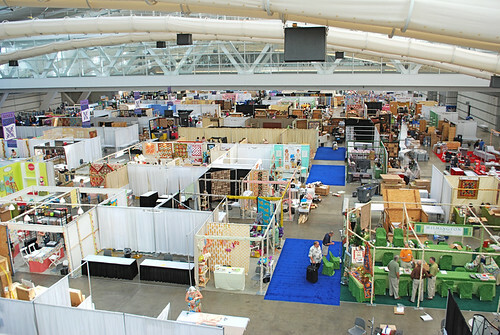 Here is a picture of all the busy folks setting up their beautiful booths (and this is just one side of the display floor). The winner of Louise's Saucy Apron pattern give away is Mushyhed who left a comment at 10:20 on 5/12. Congrats to Mushyhed!